Earlier today Mercedes-Benz Stadium released the list of its restaurant partners, referring to them as "Best of Atlanta." "Today, Mercedes-Benz Stadium announced the restaurant partners that will be featured in Mercedes-Benz Stadium and showcase the Best of Atlanta, as selected by our fans. Ranging from well-established iconic restaurant brands to best-in-class local and minority-owned restaurants, these partners will extend the fan-first pricing philosophy offering menu items priced comparably or the same as what is found in their respective restaurants." There restaurants are in addition to the previously announced "fan first" pricing which applies to traditional concession items. Mercedes-Benz Stadium is expected to open next spring and will be the permanent home of the Atlanta Falcons and Atlanta United FC, a new MLS (Major League Soccer) team. Mercedes-Benz Stadium is slated to play host to a number of large sporting events in the coming years. Among the upcoming events are the Peach Bowl (annually) as well as the SEC Championship Game in 2017 until 2027. The stadium will also host the Chick-fil-A Kickoff Game on Saturday, September 2, 2017, featuring the Alabama Crimson Tide and the Florida State Seminoles and a second 2017 Chick-fil-A Kickoff Game, scheduled for Monday, September 4, between the Georgia Tech Yellow Jackets and the Tennessee Volunteers. 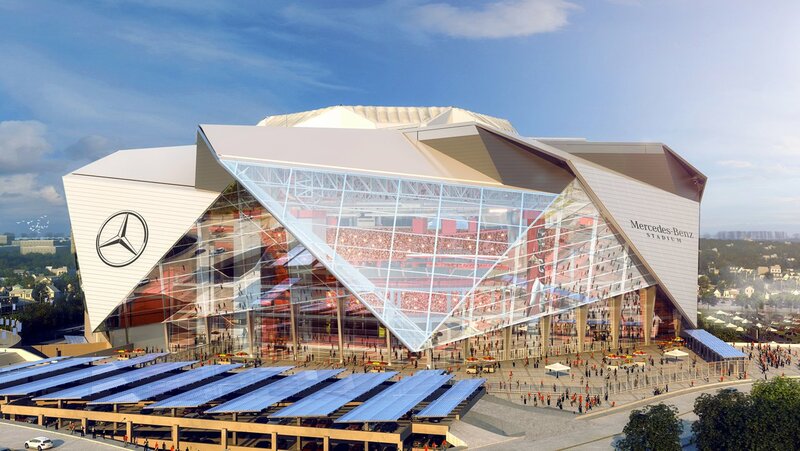 Additionally, Mercedes-Benz Stadium will host the 2018 College Football National Championship Game and Super Bowl LIII in 2019. The stadium is also expected to host the men's college basketball Final Four in 2020. What restaurant or concept are you most excited about? What other restaurant or concept would you like to see join the mix at Mercedes-Benz Stadium? Will the growth of Antico ruin the concept for you? Well, they do have some of the more well known names no surprise with The Varsity or Chik-fil-a, but sort of neat to see a company like King of Pops get in there. This will also help the growth of those restaurants hoping to expand like Fox Brothers appears to be doing. Let’s just hope some of these folks don’t expand too fast and hurt their brand. will Chick-fila be open on NFL sundays?! Great question! MBS has confirmed that in accordance with Chick-fil-A's corporate policy, the restaurant will not be open on Sundays. At the same time, the MBS rep did reveal that Kevin Gillespie is working on a "closed on Sunday" chicken sandwich for his Gamechanger restaurant. I thought they were also offering a low price option of $2 dogs, burgers and cokes etc. Is that still happening and will it be available at the MLS games as well as the NFL games? They are still doing the low price items- those would be at the regular concession stand. I don't know for sure but can't see why they wouldn't offer the same deal at the MLS games.